Terrie Peacock and Stefan Zier talk about their lawsuit against PetSmart. 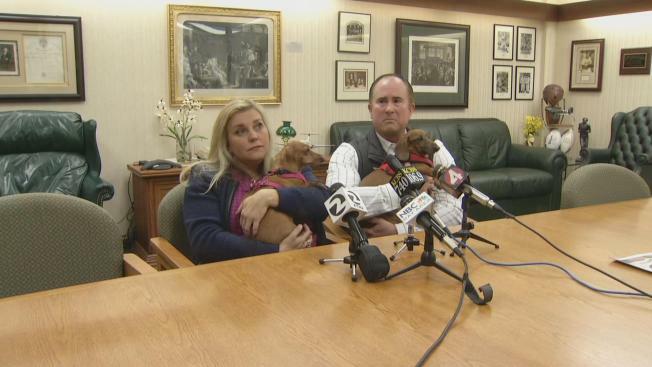 The owners of a pet dachshund who died in May during a grooming appointment at a San Mateo PetSmart filed a lawsuit Tuesday, alleging the company had received several complaints of pet injuries during grooming appointments before but failed to take action to correct the problem. Terrie Peacock and Stefan Zier's 1-year-old dachshund Henry died after he was brought into the PetSmart at 3520 S. El Camino Real on May 15 for a nail trim. Minutes after he took the dog in for the nail trim, the groomer appeared holding an unresponsive Henry, as the dog bled from his mouth. A veterinarian at the store was unable to revive the dog, and he was pronounced dead. The groomer, later identified as 38-year-old Hayward resident Juan Zarate, was arrested that same day on suspicion of felony animal cruelty. According to the complaint against PetSmart, which was filed by the couple's attorney Alison Cordova, a large number of consumers nationwide have reported serious injury or pet deaths during grooming sessions at the animal supply store dating as far back as 2010. The injuries range from severe cuts, to overheating, strangulation and blunt force trauma. The complaint alleges PetSmart knew of the complaints for years prior to Henry's death, but didn't do anything about them. The failure is especially alarming since PetSmart makes claims to the public regarding its commitment to caring for pets, according to the complaint. "The volume of reports of dogs and cats sustaining serious, and sometimes lethal injuries while being groomed at PetSmart undermines the claim that PetSmart is 'where pets are family,'" Cordova said in a statement. "PetSmart claims that it trains its groomers and annually certifies its groomers in safety. If that is the case, then it seems the system is broken." Following the incident, Henry was whisked away and his owners never saw him again, according to Cordova. A necropsy later determined that the dog was strangled. A post-mortem X-ray showed the dog also suffered two broken ribs and a punctured lung. Cordova said Zier and Peacock, who have two other dachshunds, never received an apology or explanation for Henry's death. "Their dogs are like their kids. It may be hard to for some people to believe, but the loss has been really harrowing for them," Cordova said. "It's really about PetSmart having some accountability here." Zarate has since pleaded not guilty to charges of animal cruelty and animal abuse. He's scheduled to be in court Wednesday, where a date for his trial will be set, according to San Mateo County District Attorney Steve Wagstaffe. In addition to unspecified damages, with the lawsuit Zier and Peacock are seeking to prevent this from happening again. "The goal is to change the systems, either internally or to have some sort of larger oversight and regulation of the industry. It really isn't about the money," Cordova said.